Shoetique is currently running a giveaway to win a £200 voucher to spend on some new wellies for the family now the summer days are over; if today is anything to go by this competition has come just at the right time seeing as it hasn't stopped raining today! All you need to do is enter your email address and sign up to Shoetique's newsletter and you're in! The competition is running for the month of October and see the bottom of this post for the full T&Cs of the competition. 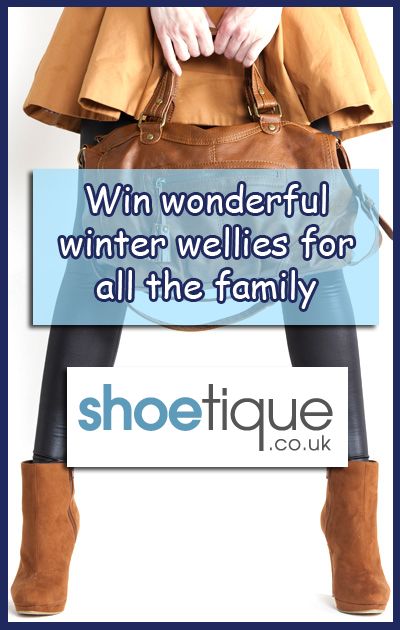 Once you've entered the competition why not do a bit of 'window shopping' and check out the range of wellies on offer. I've picked my top 9 items from the site and any 1, 2 or even 3 of these items would be fantastic for the winter ahead. Contest Rules and our Terms and Conditions, whether the entry is eligible or not. - A winner will be selected at random from all eligible entries. There will be 1 winner in total. - Winners will be notified via email. Winners may also be announced on other Shoetique social media. Upon notification, the winners must provide Shoetique with their mailing details for delivery of the Prize. All details must be accurate. - If any required information is not returned within seven (7) days of the notification of correspondence, or if any notification is returned as undeliverable, then the Prize may be forfeited and an alternative winner may be selected at our sole discretion. You must have a valid UK mailing address, and it is your responsibility to update us of any change in mailing address.